You are currently browsing the tag archive for the ‘two old horses’ tag. It’s been freezing cold here in northern Colorado­—especially so over this past weekend. And unfortunately our Golden Girls were not doing well. They’d been hunkered down in the very back of the shelter, not even venturing out for water, which isn’t a good thing. So what would two enterprising females do? Ours decided to check themselves in to a swanky hotel complete with room service, lots of sunny areas in which to hang out, and daily maid service. The Golden Girls have been living it up with lots of TLC, all the hay they can eat, fresh water only a few steps from the shelter, and their daily ration of grain from us. 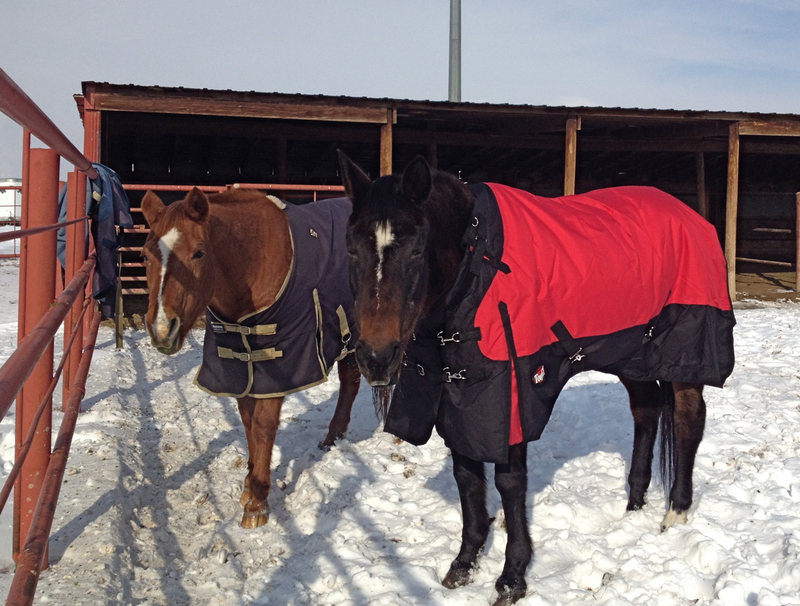 And you may notice that Miss P. has a spiffy new red coat—one that is much heavier than her old blue one. It was a frantic day on Saturday. None of us wants our animals to suffer. They’re like our children. When we got word that the girls weren’t doing well, we had to switch into high gear. But seeing them grooving in the sun, with shelter and no younger, stronger horses to push them out of the hay line, has made all the last-minute running around worth it. When the temperatures warm up, the Golden Girls will head back to the pasture. But for now, they’ve got room service on speed dial. I’ve been practicing something for a while now. Truth be told, some days I’m better at it than others. It’s a phrase (and action) I’ve learned from Rick Hanson, a neuropsychologist and mindfulness author. He teaches that our brains are hardwired to notice negative events. That’s why you can still remember in vivid detail that humiliating book report you gave in front of your entire fourth grade class, while you can’t remember a single wonderful thing about that year. It’s called the negativity bias, and we all have it. So a way to counter that negativity is to focus on the good that surrounds us each day–to notice the many gifts that seem to come from nowhere and fill our souls. Hanson suggests that we take each one in fully, reveling in the moment, allowing it to seep into our every nook and cranny and warm us like sunlight on our backs. I’m grateful that I have so many opportunities to take in the good when I’m out with the horses. There are many days when I grumble about having to go to the pasture. Days when I’m so darned busy I think my head might explode, or my entire body will burst into flame if I add one more thing to my list of things to do. Then I remind myself (again) that feeding is not an optional activity. 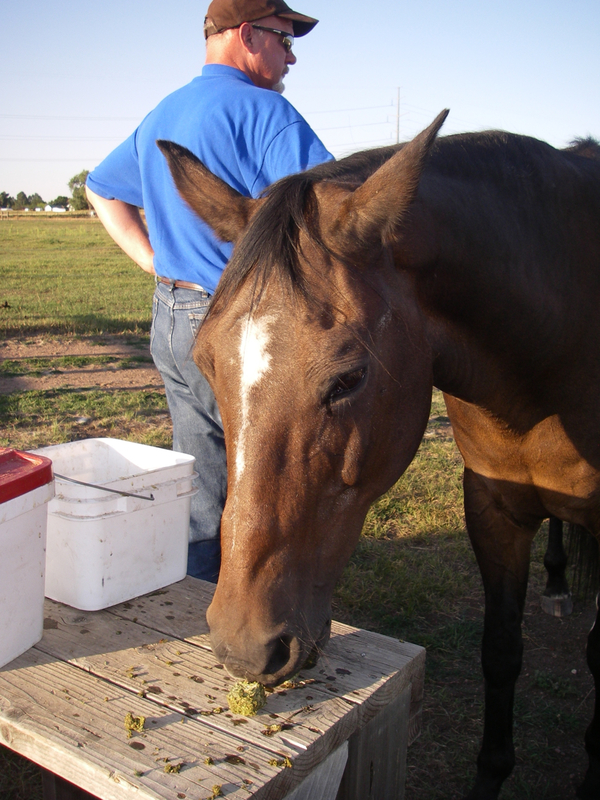 It’s a commitment–one that I’ve made to these horses and intend to keep. So one day this week I’d had a particularly busy day, and was late getting out to the horses. I was stressed because I knew it was going to get dark soon, and I wanted to be finished with feeding before that happened. I could feel that knot in my chest expanding; my head buzzed with negative self talk. And then I took a breath, and another. The horses had been moved to the far pasture, so I had to walk to find our Golden Girls. The exercise felt good, as did the brisk air. 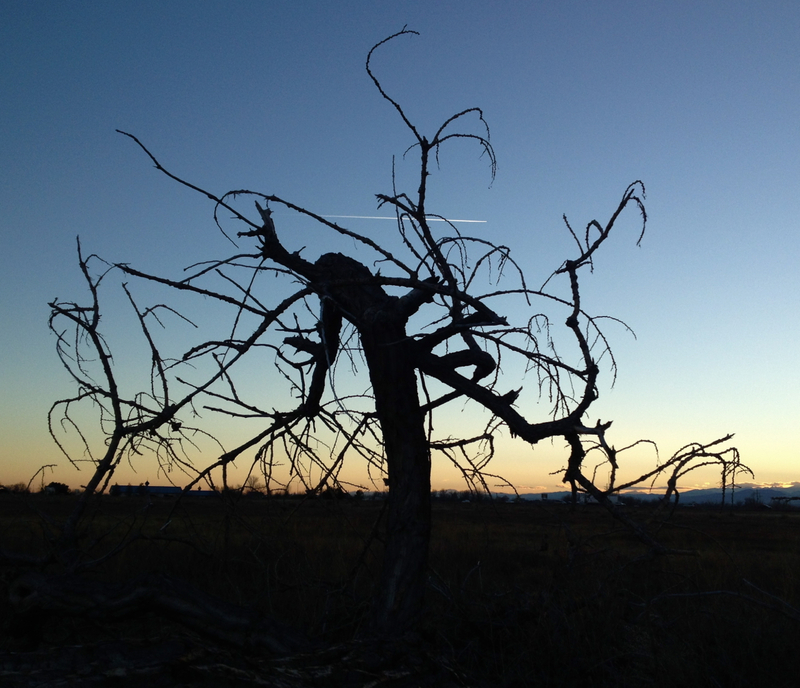 I came upon these trees backlit by the setting sun, and my entire mood shifted. It was just so beautiful. I let myself take it all in, every gorgeous limb. 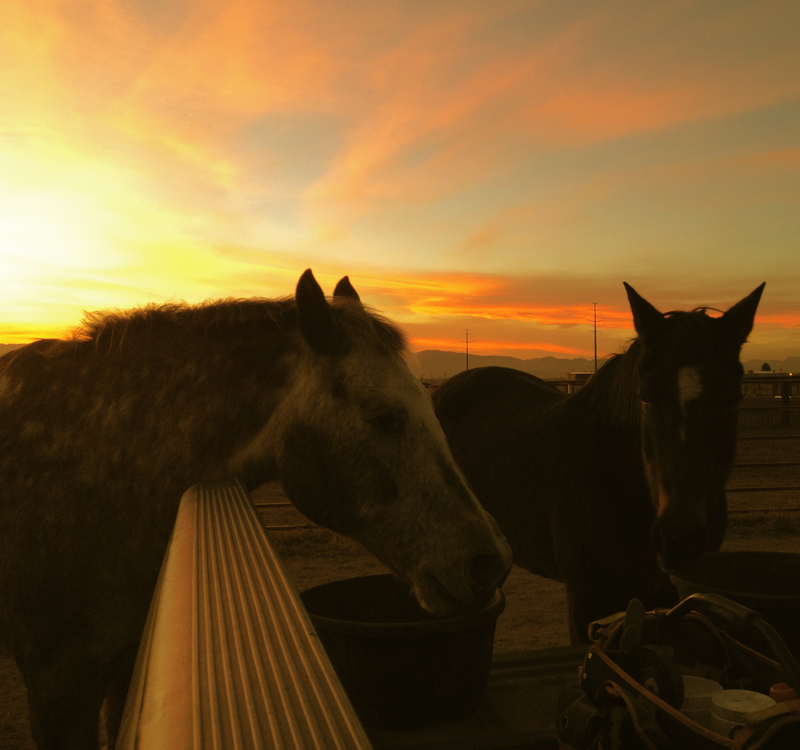 I took a bunch of pictures and then went off to find the horses, who were very glad to see me, and their dinner. Give yourself a moment or two today to take in the good. And know that I am so very grateful for your continuing connection to my adventures in the pasture. I’m a sucker for a gorgeous sunset. And my two old sweeties. Often the most ordinary of things turn out to hold the most beauty. The trick, I think is slowing down enough to really see them. 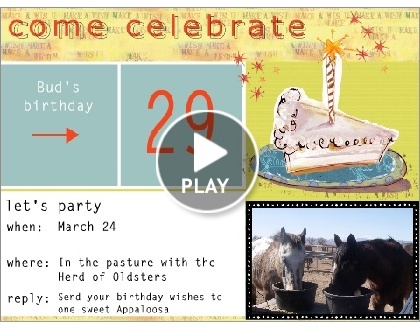 Tomorrow’s the big day and you’re invited to send your birthday wishes to our sweet appy. He’s back in the pasture with his pals, but not completely out of the woods yet. Thanks for caring about him! He and Pepper had a “moment” when they were reunited. Made my heart go pitty-pat. Is It Reasonable to Expect Fairness in This Crazy World? On Friday afternoon as I was feeding my two old sweeties I broke one of the cardinal rules of parenting.It’s a parenting rule for families with more than one child. I’ve been ignoring this gem of knowledge, this directive, for some time.I just didn’t realize it. In my defense, I did only raise one child. I never had to learn about navigating the family terrain that comes with multiple kids. But that would be somewhat of a cop-out since I’ve worked with children and families my entire professional career. So what was the rule? This egregious oversight that I committed? I know that in families, parents often twist themselves into pretzels to be fair. The phrase “bend over backwards” comes to mind. If one child gets to do something, his or her sibling gets to do something of equal import. If John gets a toy, Susie gets one. If Shannon gets invited to a birthday party, Billy gets to do something special as well. You may even have direct experience with the doctrine of fair parenting. If so, please, please leave a comment below. I want to hear how it’s gone for you. 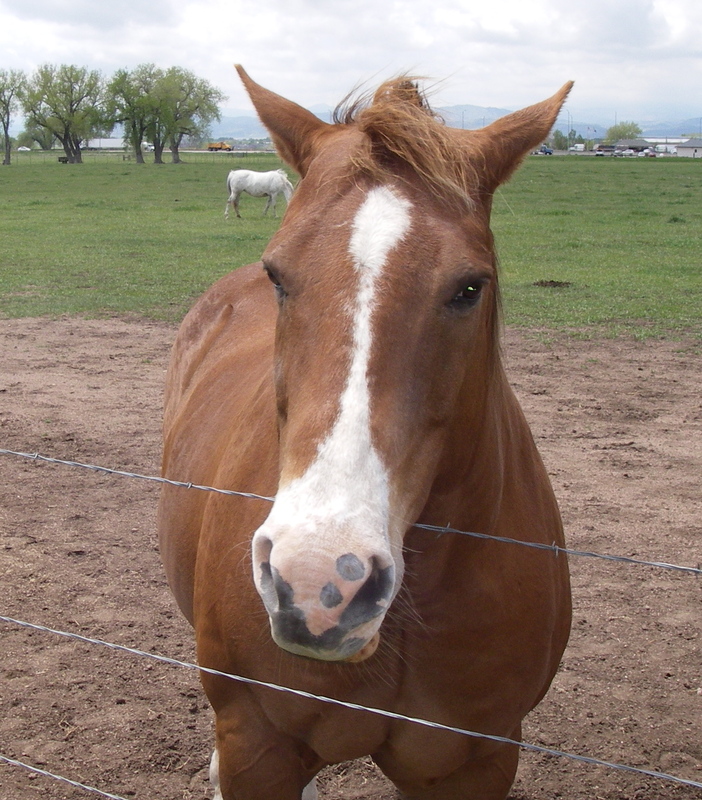 In the pasture it was Bud who pointed out my lack of fairness. 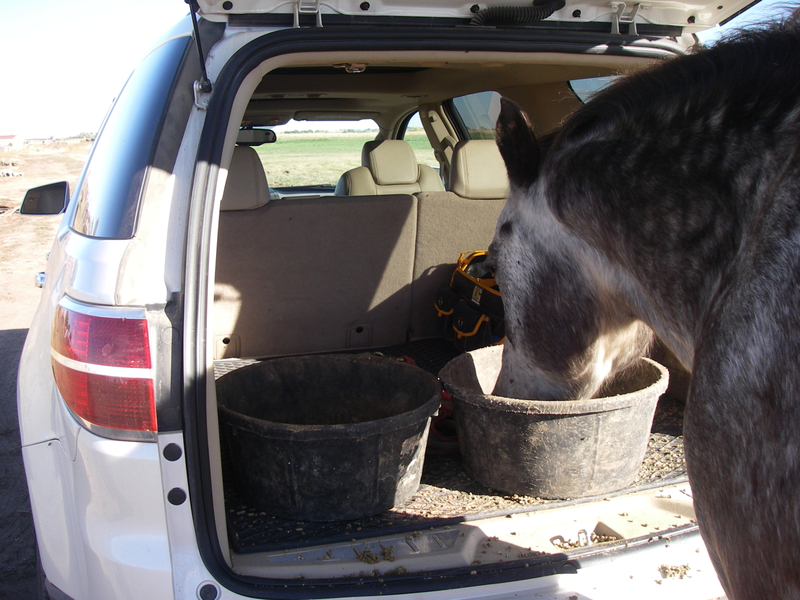 For some reason, which is now fuzzy to me, we started feeding Pepper by placing her feed pan in the back of the car, inside the open tailgate. I think it was so that she wouldn’t have to bend down so far to eat her grain. On the other hand, Bud has never had a bit of trouble eating, in any way, shape or form. We place his feed pan on the ground. On Friday, he let me know he wasn’t happy with this arrangement. He’d been giving me clues all week. I simply wasn’t paying attention. Just minutes after Bud and Pepper started eating, he raised is head, pushed Pepper away from her feed and began eating her grain. I moved him back to his pan. Minutes later, he did it again. So, I picked up his feed pan and placed it in the bed of the car, alongside Pepper’s. This calmed him and he started eating his own food. Is this what he wanted all along? To be fed the same way as Pepper? She came back to her pan and I breathed a sigh of relief. Bud getting the last bites from both pans. On Saturday I was feeling quite smug because I thought I’d worked this out. I set both pans in the back of the car, and opened the gate for the sweeties. Bud immediately went to Pepper’s feed and started munching her grain. 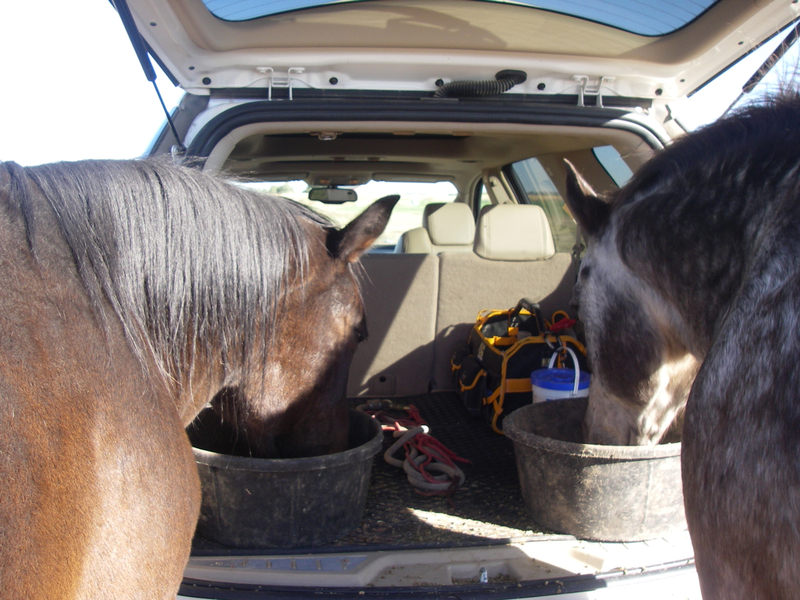 Pepper walked around the car and straight for the bucket of alfalfa cubes. I put the cubes out of sight, redirected Bud to his feed pan and walked Pepper to hers. It’s important that they eat their own food, because each pan is dosed with different medicine. I’m not just being controlling, in case you were wondering. What did Bud do next? He nudged Pepper away and started eating her grain. I muscled him toward his pan, which I’d now placed back on the ground a few feet away from the car. So much for the doctrine of fairness. Sometimes things must be as they are for good reason. Fair isn’t always the same as equal. I’m betting this holds true for families too. People seem to be in love with lists. Grocery lists, to-do lists, wish lists, Christmas lists, bucket lists, vacation lists, gratitude lists. The list of lists is endless. Pepper is authentic. She is the 100% genuine real deal. She never pretends with anyone. If she likes you, or doesn’t, it’s obvious right away. Pepper knows what she likes and goes for it. All out commitment. There is no “Maybe I like this. I’m just not sure” with her. 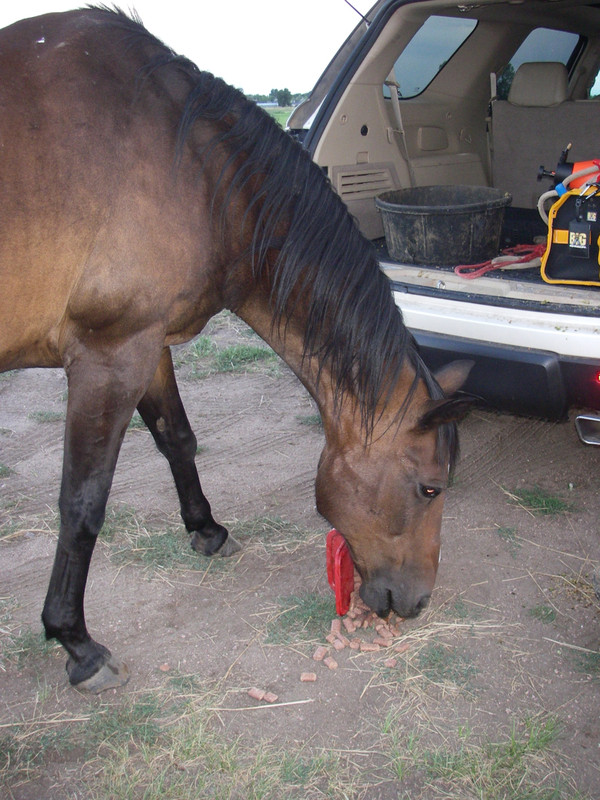 Alfalfa cubes, horse candy, being around other horses, going for a walk. She’ll let you know. She’s my role model about asking for what I want, and not settling for anything less. Pepper is a detail girl. She pays attention to the world around her. She notices things. I am in love with her face when it is on full alert. Ears perked up, face open and eyes intense. I trust her to know what’s going on. The others in her herd do too. There is a spot behind her ears that feels like velvet. The hair is short and so soft. I love to run my fingers along her ear and melt into the softness. It’s focused stress management for me. Pepper has a great sense of humor. She’s not a joke teller or one who plays practical jokes. Hers is more of a dry humor. It goes with her ability to notice things. I know she’s smiling inside most of the time. Especially when I’m doing something rather clumsily. She tolerates me, even finds me amusing. Pepper is a loyal friend. She worries about her herd mates when they are gone. She is especially loyal to Bud. 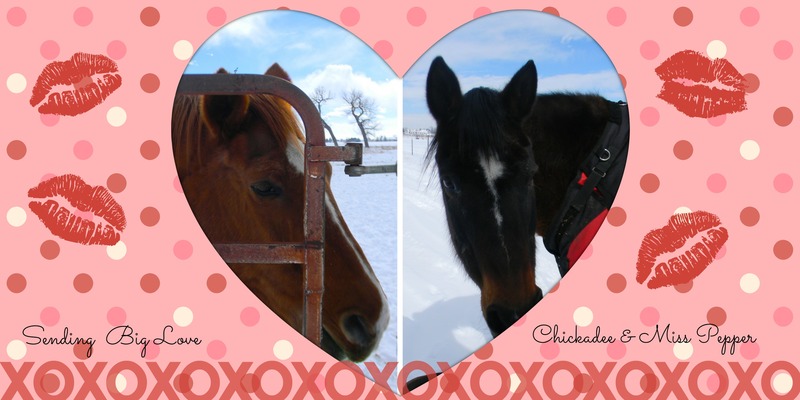 They’ve been together since 1991 and that counts for something in horse and human terms. Pepper tolerates newbies. Horses and humans. Pepper is forgiving. She doesn’t always like the things we ask of her. And yet, she continues to come to us when we ask. Who knows what she’s thinking? But she almost always cuts us some slack. There were a lot of years when I was a total klutz around her. She never made fun of me to my face. Maybe she said things to Bud or one of the others. But never to me. I appreciate that. Pepper is a leader. She makes bold decisions and then lives with them. I attribute my business sense largely to her. Show up, stay in touch, take risks, follow through, and ask for what you want. All come from Miss P.
There is a soul inside this mare that is huge. Every day she reminds me to be kind, forgiving, and open to the world around me. She is my teacher, my friend, and my soul mate. I wish you could know her. Maybe through my words you do. At least a little. When I drove out of the parking lot of the grocery store in the late afternoon yesterday, it was raining. The sky was a dull blue-black color and the clouds were dark, menacing really. The wind had blown leaves off trees and I wondered for a moment if we’d had a tornado. Come to think of it, I could hear thunder while I was rolling up and down the aisles, reading labels and trying to buy healthy food. In the car with the wipers swooshing back and forth in front of me, I made a decision not to go feed the horses. I figured they’d be hunkered down in the shed anyway. And it would be a mess out at the pasture. Was I really ready to deal with mud again? We’re getting ready for company; I’m working on a big old project with lots of deadlines, and my husband was working late. All respectable reasons to skip a feeding. But in the middle of cleaning house, working, putting the groceries away and folding laundry, it stopped raining. 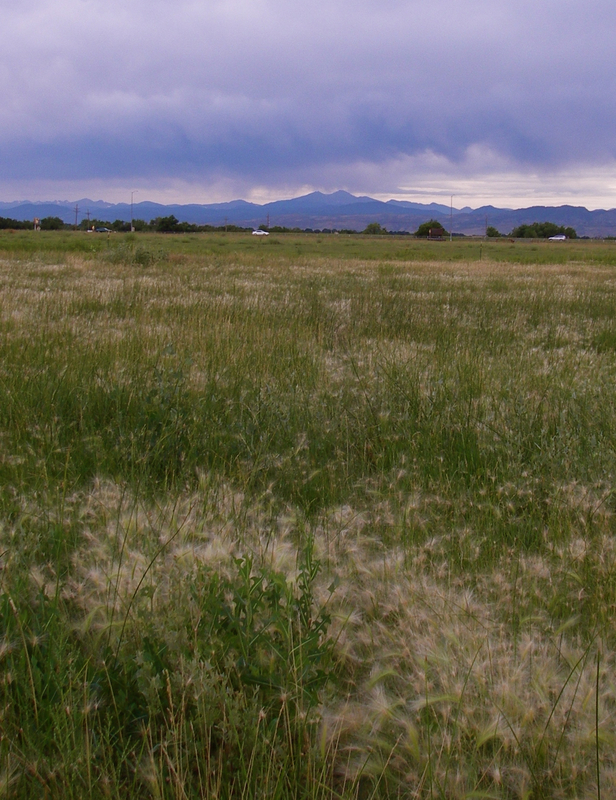 It got quite nice, as Colorado is known to do. And I realized that I needed some horse time. 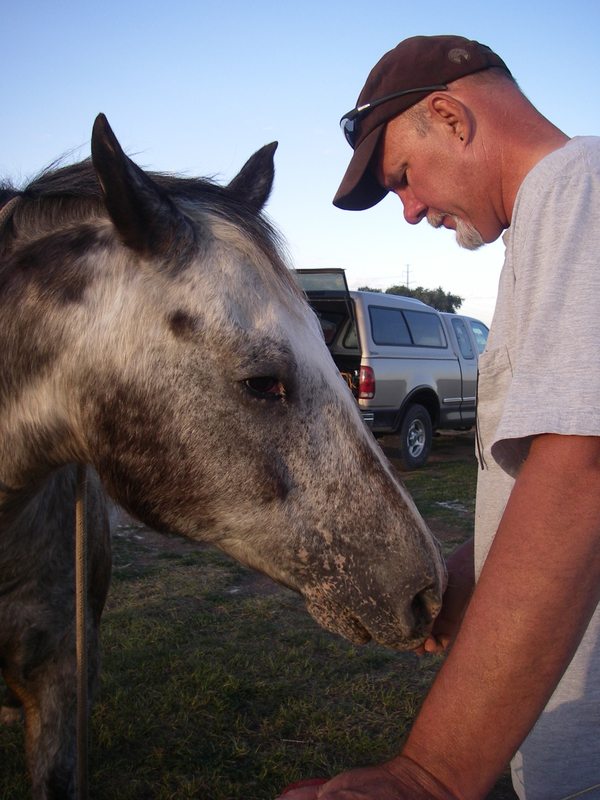 Time that required me to slow down, settle down, and simply be with the horses. So I loaded up grain and meds, changed my clothes and headed for the pasture. I’m so glad that I changed my mind. Because if I’d stayed home cleaning bathrooms I would have missed this gorgeous view. 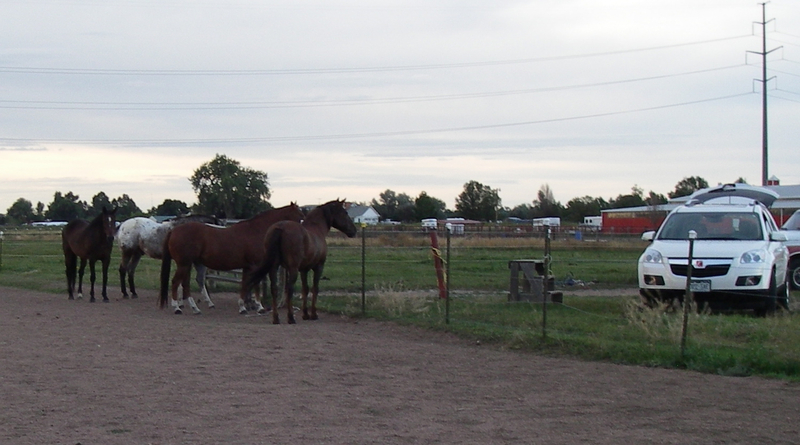 It turns out my guys were in the far end of the pasture, not in the shed with the other horses. The ones they don’t care to be around. The sun was setting, giving a lovely glow to everything. And the horses were playful. They popped up their heads when they finally recognized me. Pepper started the caravan toward the gate. At first they walked with me, but that didn’t last long. And Miss H. (formerly Hanger, but still without a new nickname. We’re considering all your suggestions.) wasn’t with them. I think she has a boyfriend. The other four continued to look for me outside the gate. 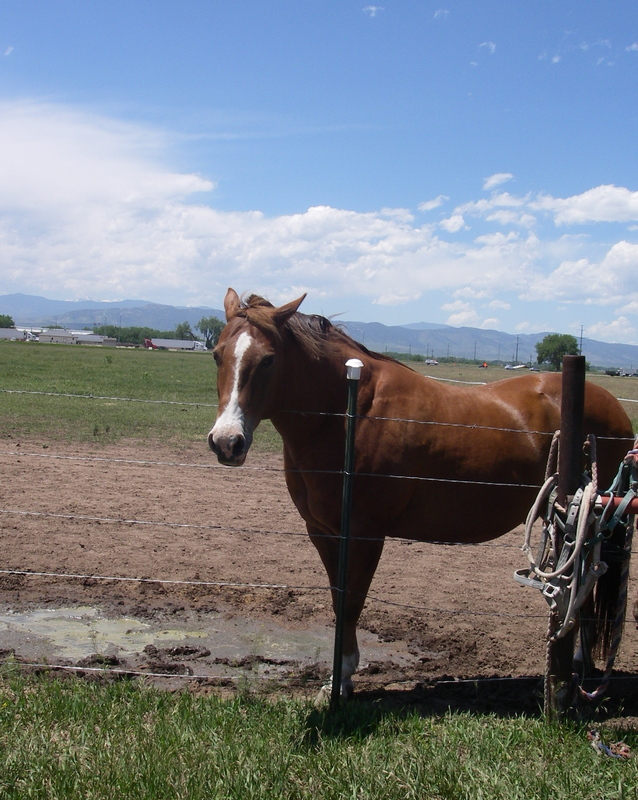 Maybe they were looking for my husband who often accompanies me to the pasture in the evenings. Yes, that’s it. I’m giving them the benefit of the doubt on this one. Bud and Pepper went right to their feed pans once I opened the gate. They munched and crunched and nosed around for treats. 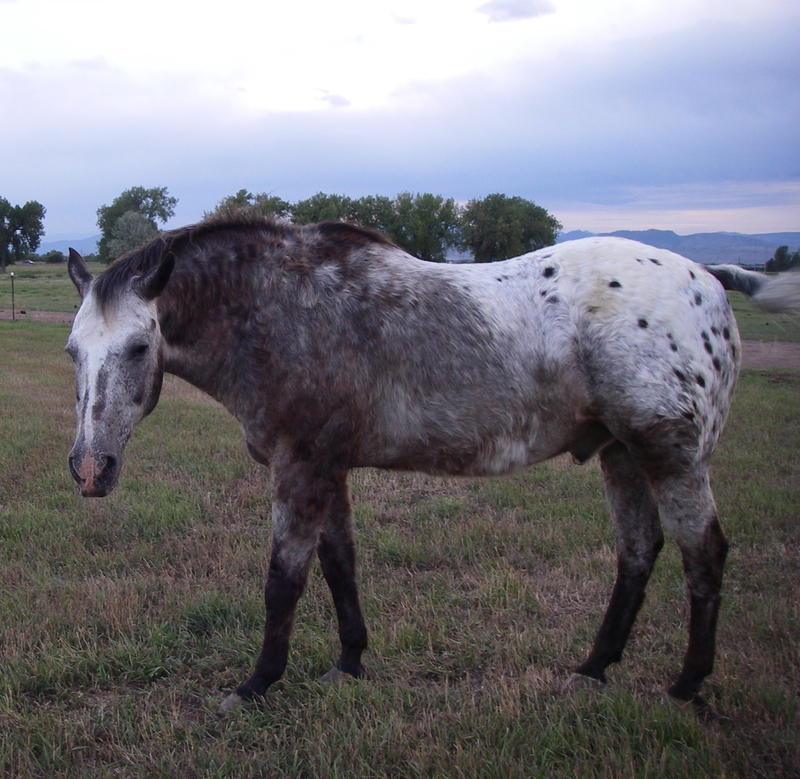 Bud eventually wandered off to graze in the hay field while Pepper finished eating. 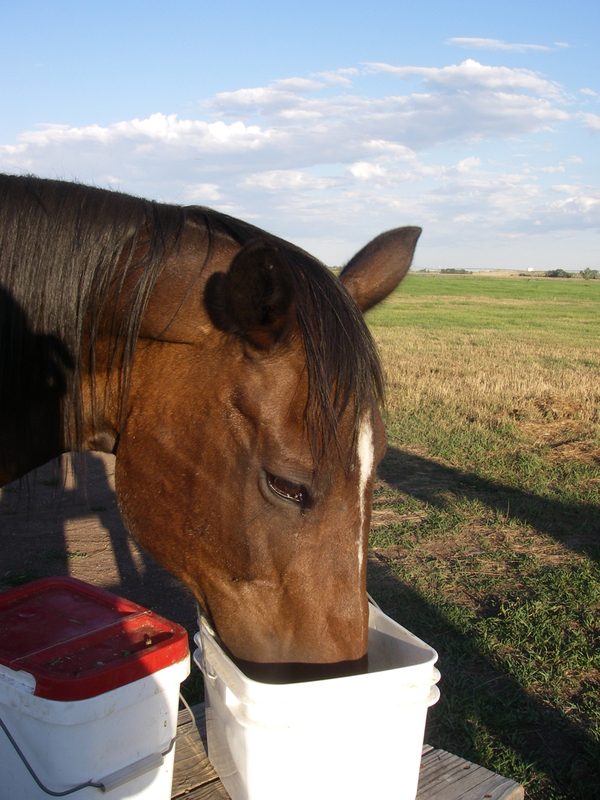 I took this photo of Bud grazing and enjoying life. And while I was distracted, Miss Pepper decided to help herself. I heard the crash and knew immediately what it was. All over the ground. 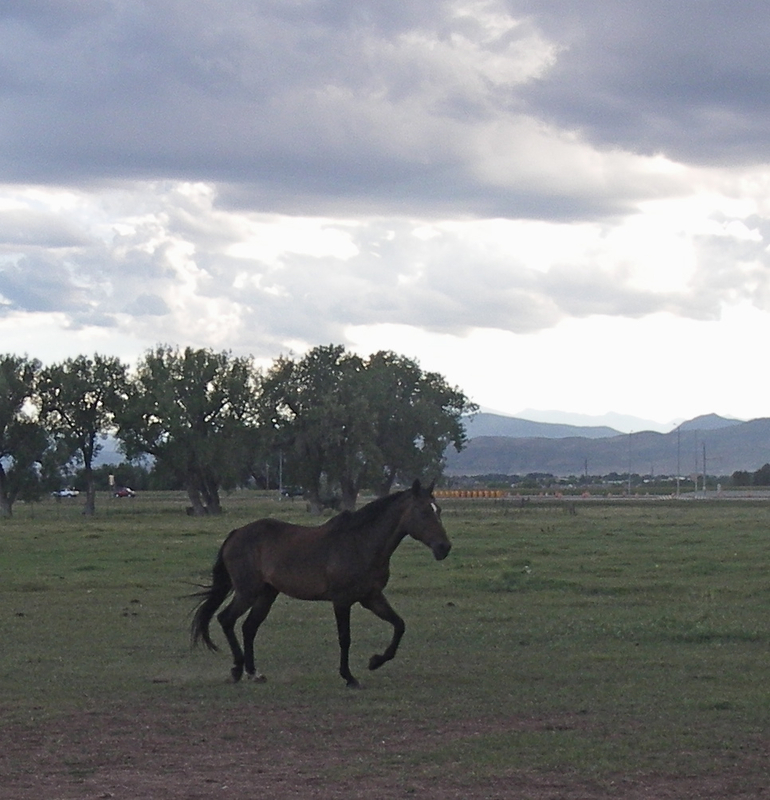 And one very proud-of-herself Quarter Horse thinking she’d hit the mother lode. See for yourself. I have it all in living color. I picked up the spilled candy, and walked Pepper back to her friends. Then I did the same with Bud. I gave everyone a rub on the forehead and one more treat for good measure. As I drove toward home I realized my breathing was slower, my shoulders were back down where they are supposed to live on my body, and I was smiling. Actually I was laughing at the look on Pepper’s face as she dove into the spilled treats. Then it was back to cleaning the bathroom.